Anyone who paid attention to the Lavabit shutdown had a feeling it was connected to Edward Snowden, the high-profile NSA whistleblower. Ever since the government's case against Lavabit went public in late-2013, people have put two and two together. Lavabit founder Ladar Levison has been under a gag order for the past three years, preventing him from disclosing the identity of the target. Nevertheless, the government's interest in Snowden's emails have been an open secret, and we now have concrete evidence, all because of a government screw up. Lavabit shut itself down in 2013 in defiance of a court order that would have required it to compromise a user's privacy—a big no-no for an encrypted email service. Since then, Levison has been nagging the court system to unseal case documents and reveal the government's target. In December 2015, Levison filed a motion requesting the removal of his gag order and the release of documents. The court responded by denying much of his request, but the re-release of "previously filed pleadings, transcripts, and orders" was ordered. The primary caveat with the document release was that it couldn't include "the identity of the subscriber and the subscriber's email address." Well, it turns out that that one job was a little too difficult for the authorities. 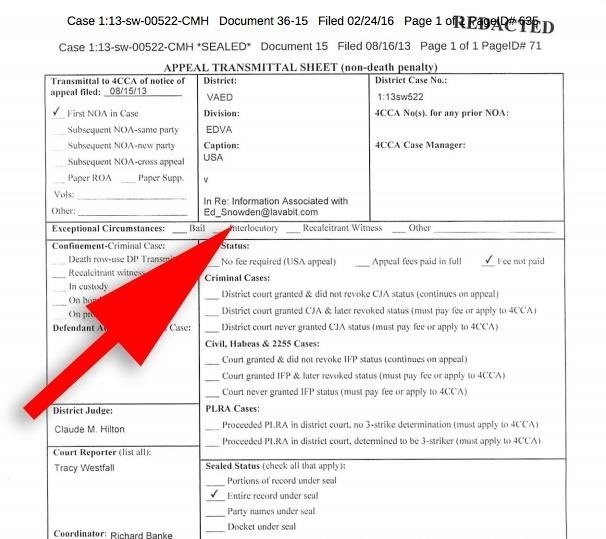 When the documents were published on March 4th in PACER, the open courts record system, they were missing a key redaction. Upon analyzing the files, it was discovered one of the documents clearly listed Snowden's email address, Ed_Snowden@lavabit.com, as the target (original file here). Finally, after a fairly absurd multi-year legal battle, a simple mistake has revealed the entire Lavabit case was indeed about Edward Snowden. News: Tom the Tool Man whoops!